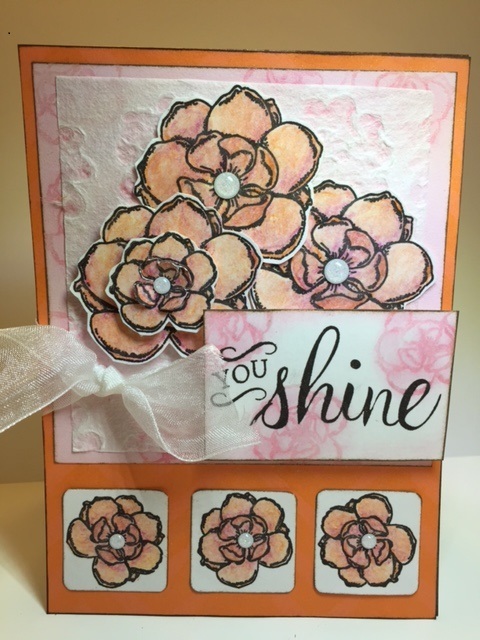 To start with, I must thank the Stampers’ Sampler Take Ten Summer 2016 Challenge for the inspiration and cute template for this card. I had this challenge in mind when I started this card however, it definelty took me longer than 10 minutes to make so, rather than a challenge submission…to my blog it goes. What new product has me excited you ask? It is the Derwent Inktense 24 Ink Pencils that I used to color these wonderful flowers images from the Teresa Collins, Moments collection by Fiskars. The Ink Pencils differ from other water color pencils in that they provide you the option of light, delicate color to rich, layered color. Great versatility! Lots of other products used on this cards as well, see materials list below. I would love to hear of your favorite techniques and/or materials so please share.